The word "sadhana" (SAH-da-na) refers to a yoga practice that consciously invites a connection to to the part of yourself that is bigger and vaster than the individual body-mind. This is a special event and will is limited to small group size, please register early to secure your space. This immersion provides the opportunity to enjoy a balanced set of practices to fully nourish your body, mind and spirit... time to truly relax, renew and refresh. The effects of stress tend to be cumulative, and can have a dramatic impact on our health and enjoyment of life. The benefits of mindfulness make it a central practice in the tradition of yoga, and current research shows that even short periods of meditation can relieve us from chronically high levels of stress hormones, reduce blood pressure and have a positive effect on the immune system (particularly in reducing inflammation) – and, above all, transform how we see ourselves, our circumstances and the world. We enjoy these benefits when we explore Mindful Yoga and Meditation, and if we stay with the practices we discover there is even more… meditative practices reveal a connection to an unshakeable ground of Well-being and direct experience of Self that extends beyond the individual body-mind. Practically speaking, some people shy away from meditation because they think they 'aren't good at it', or their bodies aren't thrilled with sitting still for a long period of time, or they just don't feel they have the time. This immersion will explore a wide range of meditative practices, including mindful yoga movement; conscious pranayama (breathing); mantra/chanting; (some) sitting meditation; and a fully guided, lying-down Yoga Nidra restorative meditation. This extended practice will be an opportunity to relax the 'project' of meditation and mindfulness while enjoying all its benefits — to bring it from being a 'good idea' to being an alive practice interwoven in all aspects of our lives, both on and off the mat. Or, you can contact Clearlight for more information by email or by phone (514) 867-8671. Yogaspace - Queen Elizabeth Health Complex (QEHC), 2100 Marlowe #346, NDG - Westmount (half block from metro Vendome). Please bring a large bottle of water. You are welcome to bring your own mat and materials, however know all materials are also provided. This immersion class is open to all levels, from new yogis to experienced practitioners. Basic familiarity with yoga and interest in meditation will be assumed. This practice is not recommended should you have a particular injury or condition that requires more specific guidance than a group context can provide. Should you be pregnant, please discuss with Clearlight in advance of your registration. Read more about Mindful Yoga here. To learn more about the 2019 schedule for weekly evening and daytime yoga classes, please visit the registration page. The intention of these indepth, extended classes is to provide a context in which you can enjoy a deep and uninterupted exploration of various practices and themes that you can bring into your daily life. We crave greater ease, balance and happiness and a sense of wholeness and satisfaction that can feel elusive... this afternoon will explore how meditation in its various forms can offer insight and be an indispensable part of our yogic journey. Through practice and discussion we will explore the difference between directed, technique-based meditation, and undirected meditation of abiding as Awareness. We will explore the value of each approach, and explore the opportunity to relax the 'project' of meditation — to bring it from being another item on our to-do list into the fabric of our daily living. We will explore a deep sensing of the body and Awareness through gentle yoga movement, as well as a fully guided yoga nidra. 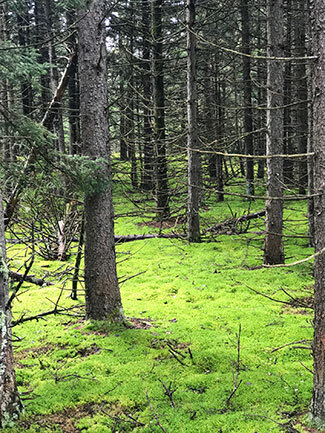 Several of the other meditative practices are simple, illuminating exercises drawn from Vijnana Bhairava, a beautiful text from the nondual teachings of Kashmir Shaivism. After a long Montreal winter, the thaw of spring and returning of green is a natural opportunity to rejuvenate one’s own inner landscape of body, mind and spirit. In this special yoga intensive, you will be given the time and space to deeply nourish yourself through ancient practices that renew, cleanse and balance our vital energies. As we deepen our practice, not only does the wellbeing of our organisms flourish - but our connection to a deeper Stillness flowers. Start the Summer by attending and connecting to your place of center and balance... come celebrate the longest day of the year and the first day of Summer with chant, pranayama and Yoga Nidra meditation! We will be gathering and basking in the full light of the season as the evening fades. We will explore the radiant vitality of our own beings amidst the vast reservoir of Wellbeing - a ground that reveals itself as we let go of agenda and are simply willing to be present. The evening practice will begin with pranayama and chanting, maybe some gentle meditative movements, and then we'll dive in for a guided, deep yoga nidra meditation to restore and balance. The immersion will be taught by Clearlight Gerald, MA, C-IAYT, E-RYT500. The gathering size is limited, early registration is suggested to reserve your place. Autumn is a return to busy and demanding schedules, back to 'juggling it all'. Now more than ever we can benefit from stepping back and immersing ourselves in practices designed to renew and restore vital energies... and to move forward with a greater connection to a real sense of wellbeing and the center of deepest Self. Trying to direct the flow of the inevitable ups and downs of life can be exhausting work. As we come to our mats we can relax all the 'shoulds' and 'coulds' and deeply rest in the unfolding of the present moment. In the simple meeting of body and breath in mindful movements, and in the exploration of yogic and meditative techniques, our deepest sense of wellbeing is naturally restored. We will enjoy several facets of yogic practices including mindful and slow asana and pranayama, unique sense meditative explorations, quiet sitting, and lying-down iRest Yoga Nidra meditation. In this series of sadhanas we explore a re-orientation of perspective - welcoming ourselves, each moment and each experience exactly as is. In doing so, we cultivate a greater sense of peace in how we live our lives, and a deeper connection to our true nature. In this sadhana we will explore yogic techniques to increase and balance the flow of prana (life energy) within, thereby enhancing mental clarity, our own healing potential and a deeper self-understanding. This afternoon will explore the theme of balance at both a physical and energetic level. 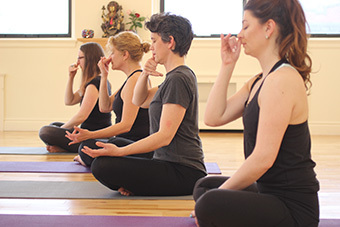 The practice will include both energizing and calming postures, warming and cooling breathing techniques and hand mudras to support the free flow of prana. Balance allows a natural sense of inner stillness and connection to surface to awareness. The session will conclude with silent meditation and deep relaxation. Most of the time we are lost in the noise created by the ups and downs of our own lives, and much of our energy is spent agonizing over the way things ‘should be.’ All too often when we come to our yoga mats we bring this orientation of striving, achieving, and judging into our personal practices. This special practice session will include slow, mindful movements as well as breathing, devotional chanting, yoga nidra and the stillness of seated meditation. "Pratyahara" is the practice of turning the attention inward and transcending sensory impressions. This practice is guided by the teaching that underneath the drama of our lives and our identity with our ego-selves, lies our true nature - pure Presence. When we dive into the spaciousness within, we open to the experience of our true selves. Each practitioner will have an opportunity to practice blindfolded, to dive more deeply into the internal experience of movement and breathing techniques. During the final hour of the sadhana, you will be introduced and guided through an experience of yoga nidra. Yoga nidra is an ancient system of progressive relaxation and self-inquiry. In this sadhana we explore the niyama 'svadhyaya' (self-reflection or self-study) in the form of guided reflections concerning your life direction and highest goals. This yoga practice will invite positive change in your life off the mat. The afternoon will include an in-depth asana practice, which will be punctuated by pranayama practice and guided meditative self-inquiry. The session will conclude with a deep relaxation. The emphasis of this extended practice will be on coming into greater alignment with your authentic self - both on the mat during your practice and off the mat in your daily life. This practice supports cultivating a trust in oneself as the final authority in regards to the decisions we make and actions we take, and ultimately how we view our place in the universe.